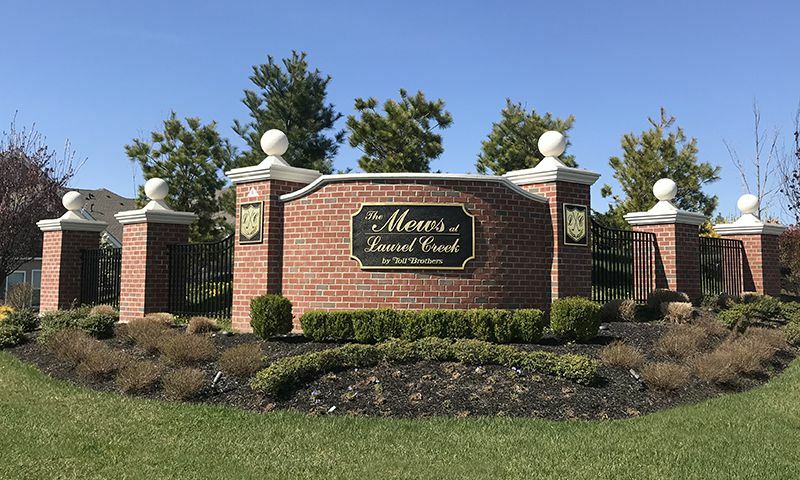 The Mews at Laurel Creek in Moorestown, New Jersey is a tranquil community specifically designed for active adults aged 55 or better. Upon completion, this new community will offer 122 attached homes and a welcoming clubhouse. The wide range of amenities and activities appeal to many different residents and the versatile floor plans meet the needs of nearly any homebuyer. Social clubs, learning opportunities, and community activities come together to support a rich active adult lifestyle. The private clubhouse will boast amenities that are tailored around the needs of today's active adults. Residents can enjoy a game of cards in the club room or stretch and tone in the fitness center. An outdoor resort-style pool and patio will be the ideal place to relax with your new friends on hot summer days. Residents can enjoy a little friendly competition on the bocce ball or shuffleboard courts or practice their short game on the putting green. For a relaxing evening, residents will be able to walk around the Mews at Laurel Creek along the walking and biking trails. There is always something fun and exciting to do at The Mews at Laurel Creek. Construction of The Mews at Laurel Creek started in 2013 with plans to have 122 residences upon completion. These attached homes are offered in seven different models and range in size from 2,260 to 2,823 square feet. These homes feature three bedrooms, two-and-a-half bathrooms, and an attached two-car garage. Each home at The Mews at Laurel Creek is appointed with high-end features. These include spacious living and dining room areas, dramatic nine-foot ceilings throughout the first floor, granite countertops, and luxurious first-floor master suites. Additional upgrades are also available and include gourmet kitchens, sunrooms, skylights, marble flooring, fireplaces and much more. Residents of The Mews at Laurel Creek enjoy year-round resort-style living amidst beautifully kept grounds. Residents have more time to take pleasure in their favorite hobbies and activities because all lawn care, snow removal, and exterior home maintenance are taken care of with the homeowners' association fee. At The Mews at Laurel Creek, there are endless opportunities for socializing, lifelong learning, volunteering and true wellness. The Mews at Laurel Creek is amidst a tranquil setting in Moorestown, New Jersey. Traveling is made easy with Route 295, the New Jersey Turnpike and Philadelphia International Airport all nearby. Downtown Moorestown is just three miles away and offers a myriad of shops, restaurants, fitness facilities, parks and entertainment. All the excitement of historic Philadelphia and New York City are also only a short drive away as well as the Lankenau Medical Center, ranked as one of the top hospitals in the Philadelphia region. The numerous possibilities and four-season climate makes The Mews at Laurel Creek a desirable active adult community in Southern New Jersey. The clubhouse and amenities are coming soon! There are plenty of activities available in The Mews at Laurel Creek. Here is a sample of some of the clubs, activities and classes offered here. These attached homes are offered in seven different models and range in size from 2,260 to 2,823 square feet. These homes feature three bedrooms, two-and-a-half bathrooms, and a two-car garage. Inside, each home at The Mews at Laurel Creek is appointed with high-end features. These include spacious living and dining room areas, dramatic nine-foot ceilings throughout the first floor, granite countertops, and luxurious first-floor master suites. Additional upgrades are also available and include gourmet kitchens, sunrooms, skylights, marble flooring, fireplaces and much more. Please Note: Not all floor plans are available at this time. 55places.com is not affiliated with the developer(s) or homeowners association of The Mews at Laurel Creek. The information you submit is distributed to a 55places.com Partner Agent, who is a licensed real estate agent. The information regarding The Mews at Laurel Creek has not been verified or approved by the developer or homeowners association. Please verify all information prior to purchasing. 55places.com is not responsible for any errors regarding the information displayed on this website.